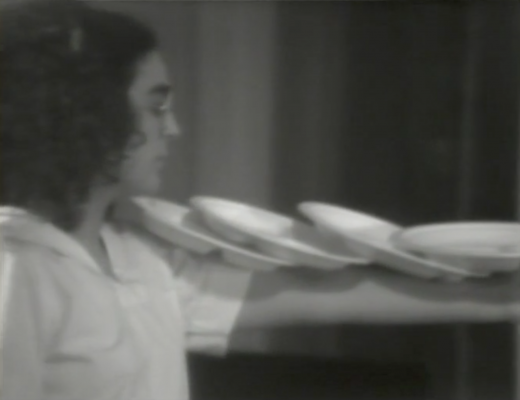 What House?, a series of eleven sections lasting one to three minutes, is about waitressing, work that many artists do to support themselves. The eleven sections overlap, making it impossible to tell where one begins and another ends. The audience shifts its attention as new information is introduced and other information is displaced. 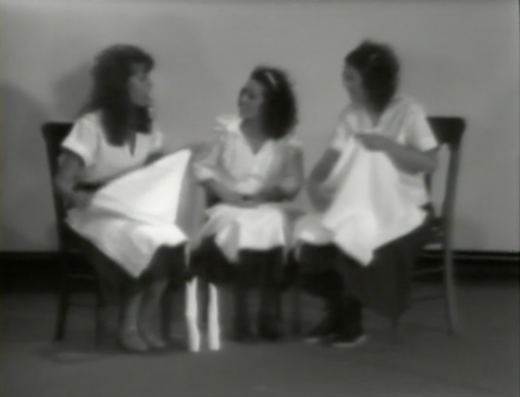 An example of the overlapping action in this work is described: Three women are talking together, folding napkins…two women leave…one woman places a napkin blindfolded over her eyes…she tells waitress stories as she folds more napkins…the other two women re-enter…one woman takes off her blindfold…one woman pretends to hang check stubs on a spindle…another woman leaves the room…the real check stubs are falling from the imaginary spindle to the floor…another woman pretends to hang check stubs…a backward bell rings six times…the woman hanging the first check stubs leaves the room…the space is vacant…another woman enters…the bell ringing stops…two women enter…one woman is at the microphone saying ‘oh,oh,oh,oh,a-oh,a-oh,a-oh,a-oh,a-oh,’ and gradually becoming hysterical…another woman balances plates in her arms, spinning and whirling with them, a kind of live tea cart…a machine sound cuts in…the plates drop…one woman picks up a blank guest checkbook and begins to write…another woman mirrors her…one waitress begins talking…the other woman mirrors the other two…the tape ends…the two standing figures read columns of active and passive verbal constructions beginning with ‘I am walking, I am walked on’… the other waitress is balancing plates…a wirewhip tape loop begins…fifteen plates fall to the floor…a plate rolls across the space…two waitresses leave…one woman does a dance with two teapots responding to the rhythm on the tape loop…one waitress says ‘oh, no,’ going from a mundane exclamation to a sensual inflection…the figure on the left becomes more sexually involved with her guest check pads…the figure on the right transforms the blue-veiled contents of a discarded vacuform container into an altar where several creamers adorned by folded napkins are placed. The action of the performance continues in this overlapping fashion. 1 – Barry, Judith. “Women, Representation, and Performance Art: Northern California.” Edited by Carl E. Loeffler and Darlene Tong. In Performance Anthology: Source Book of California Performance Art, 454-57. 2nd ed. San Francisco, CA: Last Gasp Press and Contemporary Arts Press, 1989. The world as seen through the eyes of three waitresses in a diner.